Stricker, who had never finished in the top 10 in his 11 previous trips to Muirfield Village, built a big lead with more flawless golf on the front nine, then relied on his silky putting stroke for two clutch pars to hang on for a one-shot victory. He closed with a 4-under 68, lagging from 20 feet for a two-putt bogey on the 18th hole. By then, the hard work was over. Stricker twice saved par from bunkers on the 16th and 17th holes, making putts of 15 feet and 7 feet to go to the last hole with a two-shot lead. "It wasn't pretty," Stricker said to tournament host Jack Nicklaus walking off the 18th green. Matt Kuchar and Brandt Jobe each closed with a 65 to tie for second. The 44-year-old Stricker moves to No. 4 in the world and becomes the highest-ranked American for the first time in his career. He won for the 10th time in his career, and the seventh time since he turned his game around five years ago. Dustin Johnson closed with a 65 to finish fourth, followed by Rory McIlroy of Northern Ireland, who had a 68. The biggest consolation prize went to Gary Woodland, who had a 68 to finish alone in sixth. Woodland likely will move to about No. 40 in the world ranking, making him virtually a lock to get into the U.S. Open. He had faced a 36-hole qualifier Monday morning. Stricker, who led by four shots at the turn, made it more interesting than it needed to be, especially after a 2 1/2-hour storm delay that slowed his momentum following a spectacular bunker save behind the 12th green. He had a three-shot lead with five holes to play when he missed a short birdie on the 14th, then pulled his tee shot into the woods on the par-5 15th to make a bogey. His lead was down to two, and he faced a tough finish. Stricker found the back bunker on the par-3 16th and blasted out to 15 feet, lightly pumping his fist when it dropped in the center of the cup for par to keep the two-shot cushion. From the middle of the 17th fairway, he badly pushed his 6-iron off a mound and into a deep bunker right of the green. He splashed it out to 7 feet, and the par putt again was never in doubt. Needing only a bogey to win, Stricker hit into a fairway bunker on the 18th, missed the green to the left and was happy to chip onto the top tier to 20 feet that locked up his first win of the year. "It was a little bit of a struggle since we came in from the rain delay," he said. "At that point, I was trying not to make a mistake. I hung tough, made a couple of crucial putts when I had to." While the par putts at the end were crucial, his bunker shot on No. 12 was equally big. He had to play away from the flag, bounced it out through the rough and saw it settle a foot from the cup. Stricker finished at 16-under 272 and earned $1,116,000. Almost as sweet as the trophy was getting a handshake and hug from Nicklaus behind the 18th green. 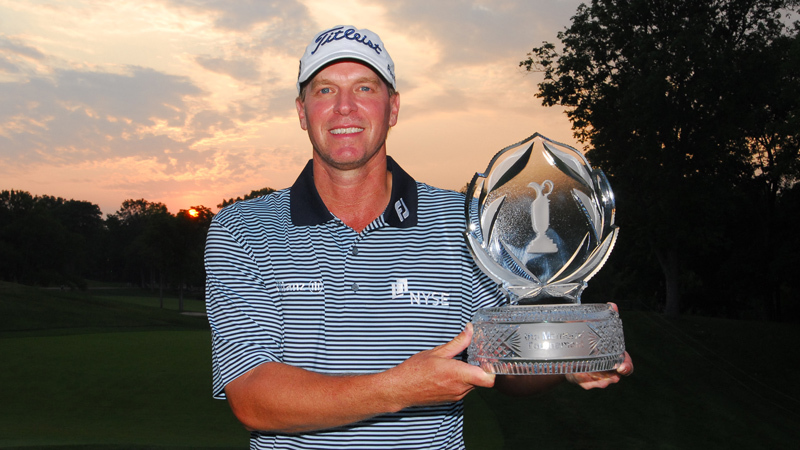 "It's pretty special walking off," Stricker said. "He's a friend, and it's truly an honor." Luke Donald, in his first tournament at No. 1 in the world, never had a chance to win but never quit trying. Donald closed with a 68 and tied for seventh, his 10th consecutive finish in the top 10 in worldwide golf. It was a tale of two nines for Stricker, as it had been all week. He played the front nine in 20-under par, including his six birdies Sunday when he made the turn in 30 to build the big lead. He played the back nine in 4 over, and didn't have another shot to spare. Kuchar and Jobe did all the could to catch him. "My 5 under on the front didn't gain any ground on him," Kuchar said. "It was tough to see. Got two more on the back, played great golf. But looks like it's just not quite good enough." Jobe has been battling injuries over the past several years, and the $545,600 pushes him over $1.16 million for the season and assures him keeping his card for next year. Jobe put the most pressure on Stricker by running off five straight birdies around the turn. "I thought if we would have gone out and shot 65, that might have been good enough," Jobe said. "But it looks like we're going to be a little short. It was his tournament to kind of win or lose, and he's going out there and winning it." Woodland would not get the official ranking until later Sunday night. He came into the week at No. 54, and the top 50 after next week are exempt from qualifying. Despite a bogey on the 18th hole, his sixth-place finish should be more than enough to stay in the top 50. Stricker now heads to Congressional in two weeks as one of the players who could be a big factor in the U.S. Open. He was a runner-up at Congressional in 2007 during the AT&T National, and that putting stroke goes a long way on any course.